Is Your Community in Need of Access Control? Last month we launched our first beta customer, Gulf and Bay Club Condominiums, on our brand new security platform, FRONTSTEPS Secure. Secure offers visitor management and credentialed access capabilities AND is fully integrated with our community management software, FRONTSTEPS Community. What makes this platform unique is that a community would typically need to buy three separate tools to do everything the FRONTSTEPS suite (Community and Secure) offers in one, convenient location. We’ve received several questions from customers wondering if Secure would be a fit for the needs of their community. Since it offers so much, communities that don’t have significant security needs, such as those without guards, gates, or concierge services, wonder how it would benefit their community. The answer is, it would! Any community that has restricted areas such as pools, fitness rooms, tennis courts, or club houses would benefit from the credentialed access capabilities offered in Secure. Access control is simply a way to manage the entrance and exit of community members, typically residents and staff, within specific areas of a community. Access levels are assigned at the individual level. This regulates which doors and gates can be accessed by someone, and at what time they can be accessed. With a pool, for example, it’s likely there will be operating hours, let’s say 7 am to 10 pm. Access levels allow you to say who has access to the pool, and at what time can they access it. Residents would be setup to have access from 7 am to 10 pm, while maintenance crews and staff could be granted 24/7 access. Earlier we mentioned “credentialed” access. A credential is what people use to open doors. Credentials can come in the form proximity cards, key fobs, or transponders. When users come into close proximity of a reader, it will cause the door to open. But much more happens behind the scenes. The reader sends data to a controller which receives data from FRONTSTEPS that verifies whether or not that user can come in. So even if your community doesn’t require visitor management needs, there’s a good chance you could still benefit from access control software. This is why we offer different Secure packages, helping customize the toolset your community needs. Learn more about our pricing packages here. Interested in learning more about security? 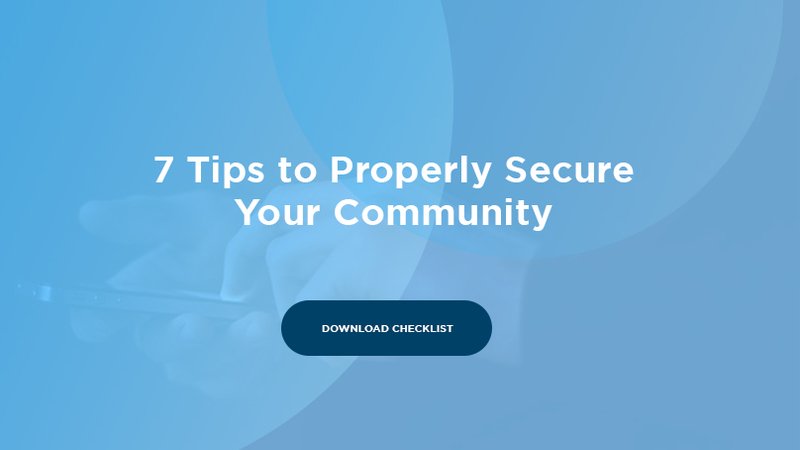 Download our free 7-Step Checklist to Securing Your Community.